The auction room is not for the faint-hearted, especially it seems when the object under the gavel is a fancy color diamond. The stakes are high, bidding frantic, egos are on the line, and the bounty can be very rare indeed. Auction rooms are also a great bastion of capitalism where the free market is at work and the Walrasian auctioneer is not a theoretical figure. There is nothing quite like the applause and cheers when a truly phenomenal item is sold at auction for a record price. The excitement that accompanies this event has been evident over the past few years for fancy color diamonds as records have been set and broken on an almost annual basis. Below is a table of some record fancy color diamond auction results from the previous four years. The table is comprised primarily of blue and pink diamonds. 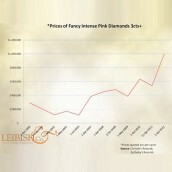 The price for the most highly sought after fancy pink diamonds has exhibited exceptional price strength over the past few years. In fact, two pink diamonds hold two distinct records for fancy color diamonds. A 5 carat Fancy Vivid Pink cushion cut stone sold for $2,166,143/carat, the highest per carat price ever paid for a diamond at auction. The 24.78 carat Graff Pink holds the record for the highest price ever paid for a diamond at auction, selling for the princely sum of $46,100,000. In Asia, The Perfect Pink, a 14.23 carat emerald cut Fancy Intense Pink, had the honor of being the most expensive jewel ever sold on the continent. Not to be outdone, auction prices for the most regal of colors - Fancy Vivid Blue diamonds have also been setting records. A 10.95 triangular Fancy Vivid Blue for a short time held the record for the highest priced Fancy Vivid Blue both absolutely $15,760,000 and per carat at $1,439,269 respectively. The per carat record was stripped from this stone exactly one year later when a 6.01 cushion-cut stone sold for $1,687,188 per carat. The record per carat price for a Fancy Intense Blue jumped by 32% in a six month period from $796,178 per carat to $1,051,636 between November 2009 and May 2010. 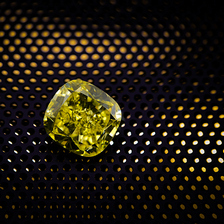 And even the less rare colors are breaking records from time to time: in November 2011, at the Sotheby's Hong Kong auction, The Sun Drop, a 110.3 carat Fancy Vivid Yellow, was crowned the most expensive yellow diamond ever sold at a whopping $12,360,000.00 ($112,00 per carat). Notwithstanding the astounding prices paid for these astonishing treasures, the price trend for these stones seems to only be up. Price records for diamonds were set in all corners of the world - if the stone is good enough, the buyers will find it and pay the price. One of the great players on the diamond stage is Laurence Graff who has the nous and wherewithal to deal in the most extravagant and expensive color diamonds in existence. 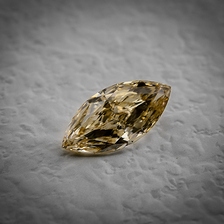 In 2008, Graff held the record for the highest price ever paid for a diamond when he purchased The Wittelsbach-Graff Diamond. Then in 2010, Graff shattered his own record when he bought The Graff Pink. In 2009, Graff actually set two records with one purchase when he purchased the most expensive pink diamond ever as well as paying the highest ever per cart price. Suffice to say that Laurence Graff is a keen record breaker, even if he was the one to set it in the first place. The famous stockbroker and advisor to presidents, Bernard Baruch, once stated that fundamentals in a stock are like character in an individual - in times of adversity they stand up to be counted. A similar thing may be said of fancy color diamonds. It is an asset class that is marketable, tradable, easily transferred, and holds its worth during times of adversity - perhaps better than any other asset class. It is amazing to consider what the next record breaker at auction will be. Nobody can predict the size or color, but the Argyle Pink Jubilee, a 12.76 pink rough diamond that was recently announced by Rio Tinto's Argyle mine is certain to grab the attention it deserves. 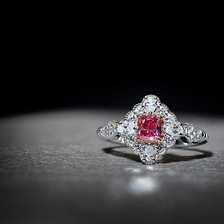 The diamond is the largest pink stone found in that mine from the 26 years in operation. As only 18 stones over 10 carats have been auctioned in Christie's over the last 244 years, expectations for this stone are extremely high. In these turbulent times in which we live, it is reassuring to know that a little colored stone can not only bring a smile to our face but also be a harbor in the tempest. Don't let another opportunity slip through your fingers without taking the time to properly investigate what kind of potential gains these diamonds offer. Speak with one of our experts today and let us open your eyes to a little bit of color!